Koonz, Claudia. 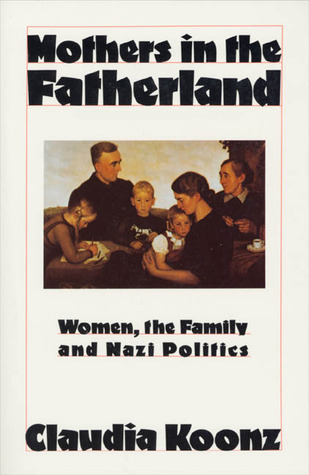 Mothers in the Fatherland: Women, the Family, and Nazi Politics. New York: St. Martin’s Press, 1987. In an interesting and provocative book, Koonz evaluates women’s role in the world created by the Nazis. Ultimately, Koonz concludes that “Far from remaining untouched by Nazi evil, women operated at its very center,” (6) and “women made possible a murderous state in the name of concerns they defined as motherly” (5). Central to Koonz’s argument is the fact that, from the beginning, Nazi ideology was based on two distinctions: Aryan versus Jew (and all non-Aryans) and man versus woman. In other words, Koonz sees racism and sexism as two basic tenets of Nazism. Just as Aryans were superior to Jews, men were better than women, and this was seen as representing the natural order of things. Koonz argues that women, or Nazi women in particular, were willing to accept their inferior (“traditional”) status in return for rewards that varied from material goods to social prestige and honor. But Koonz shows that many Nazi women wanted more than a “Mother’s Cross” in exchange; they wanted greater control over their own social sphere. To understand women’s stance in Nazi Germany, Koonz rightly argues that one must first look at the Weimar period. The women who would later become “Nazi women” did not view the emancipation of women during the Weimar period as an emancipation at all. They had to take up civic responsibilities that they weren’t required to before; they also felt more burdened by having to work to earn wages, wages lower than those paid to men. Essentially, they felt that they were being forced to give up traditional values and roles (48). There existed among women, then, a desire “for a society based on what sociologist William Goode called the “family of western nostalgia” (219). The Nazi Party offered such a vision, while also not demanding that women take part in the politics of it all, which is the explanation Koonz offers for why women did not simply join other conservative parties. But, a return to traditional values (including separate spheres for men and women) did not mean that women expected to be told what to do. Nazi women “hated the New Woman, but did not under any circumstances dream of returning women to narrow housewifely tasks” (122). Nazi women organized and planned for the creation of a feminine Lebensraum inside Germany, a “social space” where women worked independent of men’s authority to help implement the Nazi vision as nurses, teachers, and social workers (7). But Koonz portrays these women as naïve, because once the Nazis took power it became clear that women could organize, but they would obey the men’s orders (172). Koonz also shows that while women perceived the home as being “their” sphere, separate from the world of politics, the family actually became the site where Nazi ideology became personal, where good Nazis could be raised. Therefore the notion of separate spheres was more or less a sham (389). But it was important that men and women continued to perceive the home and private self as a separate spheres from work and the pubic self. Indeed, this is how Nazi wives helped contribute to murder. By offering a traditional, feminine home where Nazi men felt loved, women offered a place where men could “touch base” and feel human again before going back to work at a death camp the next day (418). Moreover, Koonz suggests that many women knew what their husbands did, and so reassured him that what he did (public) was separate from who he was (private). While some of her conclusions may be questionable, Koonz shows us that women were instrumental in implementing Nazi vision, and moreover, they perceived themselves as the harbingers of Nazi values. That’s what makes their story so important. For a longer list of books on German history, see my post here.